Join docents Lynne Armstrong and Patty Robb for a tour of the Western Art galleries and the exhibition Georgia O'Keeffe and Ansel Adams: The Hawai‘i Pictures, followed by an art discussion over a glass of iced tea in the café. Visitors meet the docent at the entrance to the museum. Pictured left: White Lotus, 1939. Georgia O’Keeffe (American, 1887-1986). Oil on canvas. Muscatine Art Center, Iowa (1990.53). Given in honor of Elizabeth Mabel Holthues Stanley by her family. 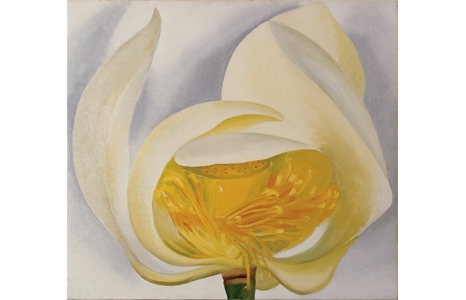 © Georgia O’Keeffe Museum/Artist Rights Society (ARS, New York).